During my recent trip to the USA I visited New York City and Miami and got to stay in two very different hotels. The hotel in NYC was the newly opened Element Hotel, located in the heart of Manhattan and close to Times Square. The Element Hotel represents a a new brand and concept within the Starwood Hotel Family. The second hotel was Miami’s Quarzo, located in the exclusive Bal Harbor of Miami Beach. The Quarzo is a Condo Apartment and Hotel concept that is one of Miami’s best kept secrets. Although both hotel products are very different in terms of location and clientele, they both use their space in ways that create value to their guests. The Element concept takes some of the best signature items from other Starwood Brands, such as the Heavenly Bed and a variety of eco- friendly practices to create a very different type of hotel. In a way it takes themes from Boutique or Lifestyle hotels and incorporates them in a “compact” and innovative way. • Eco- Friendly philosophy: non- smoking hotel, green buildings, recycled materials in carpeting, furniture and flooring. • Smart Design and very comfortable guest room and public facilities, including Heavenly Bed Concept, (link), ample closet space, a lot of lighting, large free internet and TV lounges. • Full- kitchenette concept for the extended stay sector. 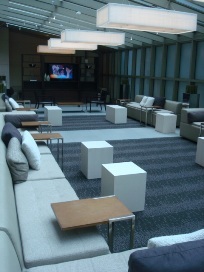 Complimentary Breakfast and afternoon snacks and Free WIFI, all creating extra value. Interestingly, the only thing that was strange and contradictory at the Element was that the complimentary buffets that the hotel offered as part of the stay were actually not “green/healthy” at all. They were catered by outside venfors offering pre-packed sandwiches, fried items and no vegetables or fruits. All in all I do recommend this hotel, just blocks from Times Square and offering reasonably New York rates with a lot of add- ons. Quarzo Hotel in Miami’s Bal Harbor is indeed a boutique Hotel but with the twist of an all- suite hotel that offers also rentals and permanent residential options. Value is created here by the very large suites that the hotel offers. It is one of the most “private” small hotels I have encountered. The hotel features a very small reception area with a long corridor of suites and a beautiful Zen Garden & Pool area in the back facing the Bal Harbor Bay with beautiful ocean views. It is discreetly tucked away behind the Bal Harbor Bridge surrounded by Condo Residential buildings away from major thoroughfares. Again, the use of space to create value was very apparent but this time not in communal lounges or food & beverage facilities, but rather suites that steal the show with a very large full kitchen, balconies, large TV lounge area, large master bathroom and, beautiful Italian furniture and complimentary amenities such as refreshments and snacks. The outdoor Zen Garden offers hammocks and lounge chairs facing the bay and a small quiet pool. For those looking for great guestroom space and a very relaxing pool side area instead of the “party /bar scene” of Miami, this hotel is perfect. It is a a little expensive but worth it. Don’t forget that this location is one of the most exclusive areas of Miami with the famous Bal Harbor Shops and the fancy Health Fittness & Spa “One”. I strongly recommend an excellent restaurant in Bal Harbor, named Carpaccio. I`m putting this on my to do list, definitely have to get there.